The first place you want to go when you’re beginning a fundraising effort is your friends and family. While the idea of bringing in a high dollar donor might seem amazing, focus first on the easier conversions. Also, chances are, it’s a lot easier for you to access your best friends email address than it is that high net-worth donor’s email address. Asking people for money can be terrifying. It shouldn’t be. You’re asking them to donate to something you really believe in. Something you think is necessary. It’s important to realize that the worst thing someone can say to a donation ask is “no”. 3. Learn the difference between “no", "not that" and "not now"
When you’re asking people to donate to your fundraiser it can be hard to differentiate between a hard “no”, a “not that”, and a “not now”. Give your audience multiple avenues to go down. Just because someone doesn’t want to give money in that moment doesn’t mean they wouldn’t volunteer or set up a peer-to-peer fundraiser to raise money from their community for you. If you get a no, try to follow up with a secondary ask. Storytelling is the single most powerful communications tool that we have available to us. You could make the case that the story is a fundamental piece of human communication. There’s significant science that shows stories convert far better than statistics do. That isn’t saying that statistics aren’t important, it just means that if you have statistics that are compelling you should find a way to weave them into a story that helps get the point you are trying to make across. Interested in learning how you can unlock the power of storytelling for your organization? 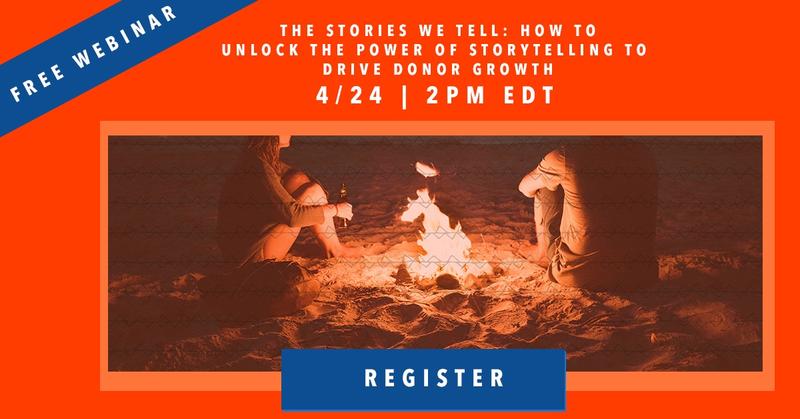 Sign up here for our educational webinar "The Stories We Tell: How to Unlock the Power of Storytelling to Drive Donor Growth" today. This ties into both tip number two and tip number three. Make the donation ask. Then make it again. There’s a reason you might get fundraising emails more than once. Just because people won’t give in that initial moment doesn’t mean they might not some time down the line. 6. Ask people for a recurring donation. Seriously. Organizations who aren’t building recurring donations into their online fundraising program are leaving a lot of money on the table. The average recurring donor will give 42% more in one year than those who give one-time gifts. Not just that, recurring donors are more than two times more likely to give beyond one year. Asking for a recurring donation is also a lot easier online than it is over the phone. 7. Close the loop. Say “thank you” even if they say no. I don’t know about you, but I was raised to always say please and thank you. The same follows through when you’re communicating with your donors. So many organizations forget that the last step in their communication is to close the loop and thank each person they speak to or email. These thank you communications are also a great place to re-up your donation ask. See tip five. Ask, ask again. 8. Update your donors – Tell them what kind of an impact their contribution made. People are giving you their money so you can do something specific with it. It’s important to follow up with your donors to let them know what kind of an impact their work has had. These updates are also a great place to reup the donation ask. If their money went that far, what else can it do. Make the report back specific, and tie your next ask directly to it. All in all, while there are key differences between standard fundraising and online fundraising the best practices you build in standard fundraising carry through. What tips do you have for running a successful fundraising campaign? Let us know on twitter using the hashtag #donorhacks.